One of the many untold stories of our home construction (at least until now) is the tense and thrilling tale of the sill plate. 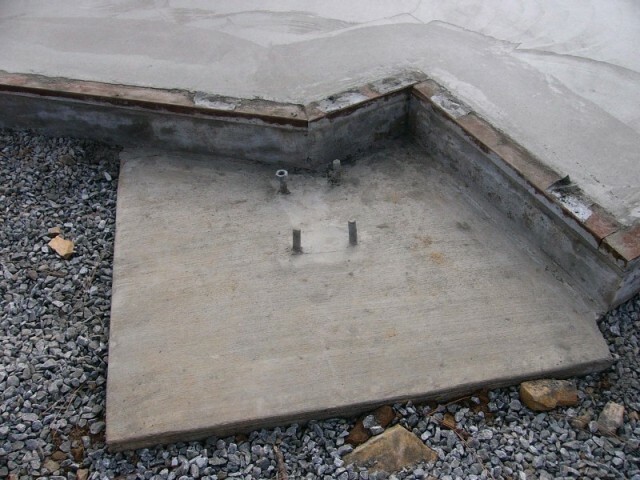 When a house is built on top of a foundation that is basically a concrete slab, it can be difficult to find a method to bolt the walls down. The solution is a sill plate, a strip of wood that runs horizontally on top of the foundation wherever there's going to be an exterior wall. The sill plate is anchored onto the concrete foundation. In turn, the walls can be nailed or bolted onto the sill plate. Back when Rick Dietrich first laid our foundation last winter, he also installed a sill plate per the specifications from Topsider. Rick also informed us that there was an error in the specifications. According to the plans, round washers were to be used with the anchor bolts. Unfortunately, the state of California requires square washers on sill plates. Apparently, California feels that square washers distribute the weight of the wall more evenly (either that, or the square washer industry has an incredible lobby in Sacramento). Using the specifications that he was given, Rick assembled the sill plate using round holes, but with our knowledge and permission. Topsider promised to supply the correct square washers, and we figured that we would simply drop the square washers into the round holes. We received the square washers at home in the Bay Area, and brought them up with us to fix the sill plate as part of our house building party this week. Therefore, it was not until we began work on Saturday that we made an unpleasant discovery: the square washers did not fit in the round holes. Square washers in round holes: "Oops..."
As a consequence, every single one of the 32 sill plate holes would need to be enlarged manually in order to fit the new washers. The first plan was to chisel each hole by hand, using a hammer and a screwdriver. This turned out to be tedious and exhausting; and once we got the generator hooked up, we used a drill instead to notch out the corners. Rick Dietrich was kind enough to lend us the air compressor that he had in the back of his truck, so we could clean all of the dust out of the holes. 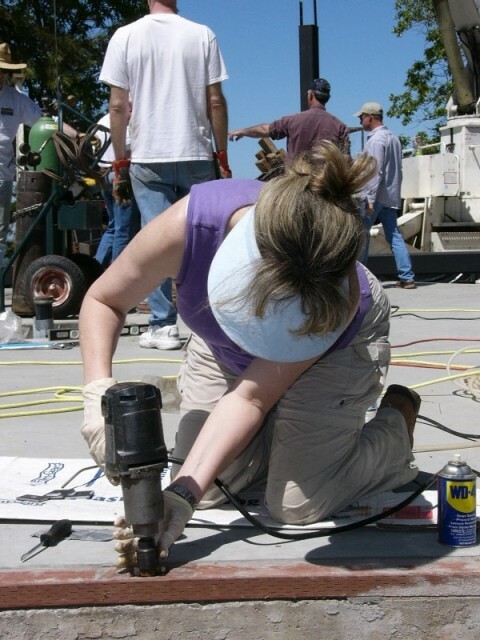 The last step was to use an impact wrench to tighten the anchor bolts and washers, completely securing the sill plate to the foundation. It took almost the entire day, but at least it was finally finished. As he began to look around, Russell joked "And I hope you like all of the square washers that we put on the sill plate." Dennis replied, "Yep, but you've got a problem here." Russell's face fell. "The washers and bolts are supposed to go on top of the sill plate, not in it." Dennis went on to explain that by drilling holes into the sill plate, we had weakened the sill plate's structure. Instead of having a full inch of wood holding the sill plate to the foundation, we only had about 3/8". Gail just about freaked out. After all our hard work, she was not looking forward to removing all of the washers and anchor bolts. 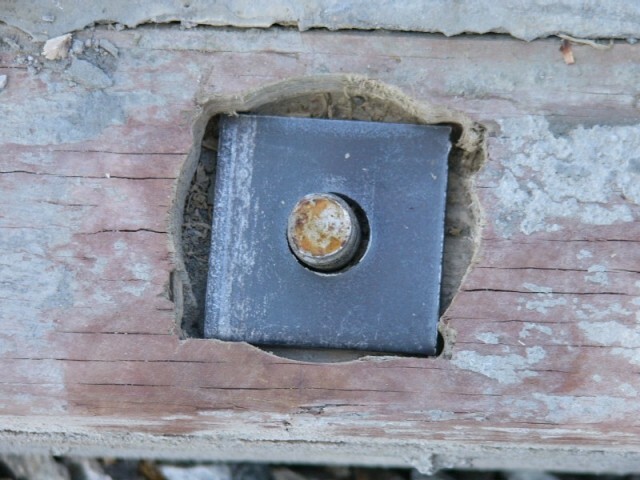 Even worse, the current bolts -- set into the foundation -- were flush with the sill plate. Even if we replaced the wood, the bolts would not be long enough to fasten nuts on top of the sill plate. Rick Dietrich would have to come back out, jackhammer the entire foundation, and reinstall longer bolts. Thankfully, this story had a happier ending. Gail and Dennis spent a long time poring over the blueprints, and Dennis saw that none of the exterior walls was load bearing. In fact, thanks to Topsider's post-and-beam engineering, the walls would be very solidly set in place once they were installed. Dennis made a judgment call that the current sill plate would suffice. In the end, Dennis gave an overall thumbs up to our work so far… and a green light to proceed.